We’d love your help. 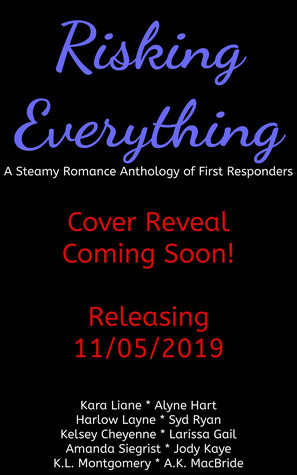 Let us know what’s wrong with this preview of Risking Everything by Kara Liane. Love heroes? We've got them all: military, police, firefighters, EMTs, doctors, dispatchers, ski patrol, and more! This charity anthology features nine of your favorite romance authors who are bringing you nine amazing new novellas. Each story centers on first responders who risk ev Love heroes? We've got them all: military, police, firefighters, EMTs, doctors, dispatchers, ski patrol, and more! This charity anthology features nine of your favorite romance authors who are bringing you nine amazing new novellas. Each story centers on first responders who risk everything each and every day. All proceeds will go to the Stephen Siller Tunnel to Towers Foundation (tunnel2towers.org), a charity benefiting Veterans/first responders. To ask other readers questions about Risking Everything, please sign up. Kara Liane is a lover of all things romance, and a protector of the environment working as a Lab Tech. She holds several degrees, including a master’s in management from Wayland Baptist University. Her husband since 2002 proudly serves in the military. The family, which includes twin elementary-age sons and two adult dogs, resides in New Jersey. In her spare time, she reads and writes various things including poetry, stories about her kids, and her new novels.